FolioX is a responsive and mobile ready WordPress theme designed to display a collection of photographs using full width images, smooth off canvas navigation and a clean elegance free from distracting elements. I wanted a simple theme that does one thing but does it well: display a series of photographs in a way that allows people to get lost in them. To establish that kind of connection online meant following the same strategy I used in the photographs to engage people, using composition to create a “window” to look through to see the world inside the photograph. To be effective any potentially distracting elements outside the “window” must be minimized or removed. FolioX was made to mimic a classic print folio, a collection of beautifully crafted loose prints with identical proportions layered with tissue paper and contained in a single volume. FolioX is my attempt to simulate that physical experience in a virtual format. 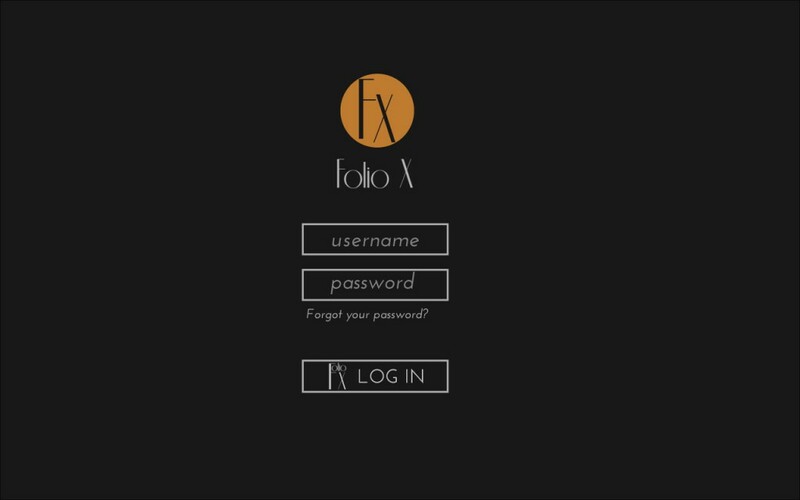 The Folio X log in page. 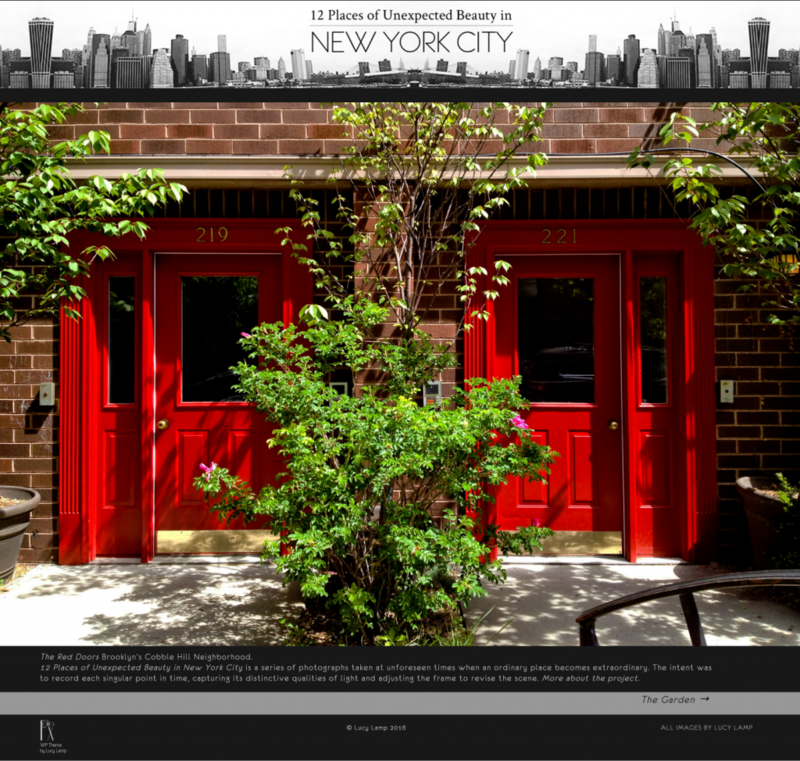 Full width images, off canvas navigation, three color schemes, optional full width adjustable size custom header, previous-next links using photo titles or thumbnails, pages for photo notes, project description, photographer bio and other informational pages, social media bar. Responsive, mobile ready and accessible. Admin section for choosing a color scheme. Classy elegance with a light clean font (Josefin Sans Regular). 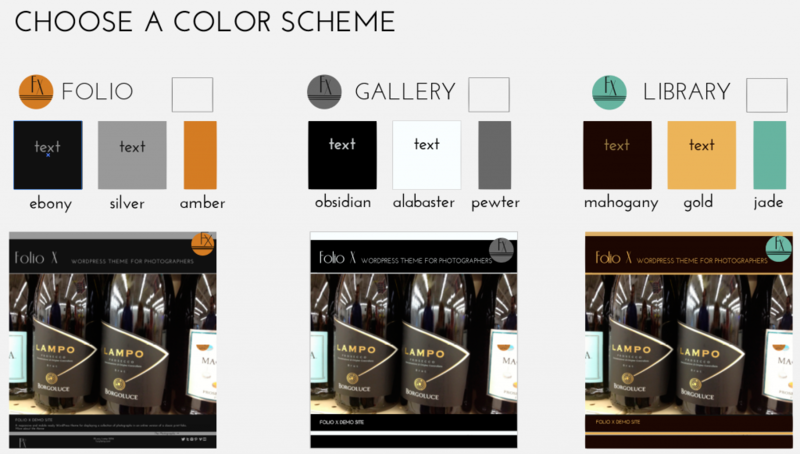 Three color scheme choices: the default ‘Folio’ in Ebony and Silver with Amber accent, ‘Gallery’ in Obsidian and Alabaster with Pewter accent, and ‘Library’ in Mahogany and Gold with Jade accent. Layout: image header, menu icon, tagline, title, full width photograph, caption/description, page navigation links and footer, interspersed with bands of the scheme’s colors. The theme includes two types of navigation: a slide out menu listing all the site’s pages, and ‘previous-next’ page links at the bottom of the page. Both menus incorporate thumbnail images. Thumbnails for the menus are automatically generated when a photograph is uploaded. The menu icon in the upper right hand corner of the screen activates an off canvas, responsive menu which slides in smoothly. 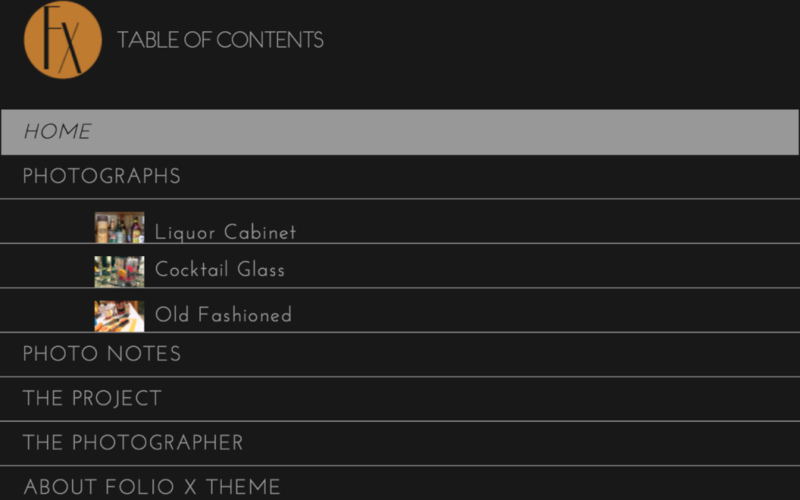 The pages are listed as a table of contents, reinforcing the idea of a print folio. Hover effects help navigate through the menu. ‘Previous-next’ navigation can be used to page through the site similar to leafing though a book. The links use titles and thumbnails of the photographs. Options include: titles only, thumbnails only, or both titles and thumbnails. Like the rest of the theme, the behind the scenes admin area is clear, easy to understand and free from distractions or unnecessary information. It maintains the clean design and color scheme of the rest of the site, providing a seamless experience while editing or adding new content. Admin pages include: Log In. Welcome Screen with clearly delineated options. 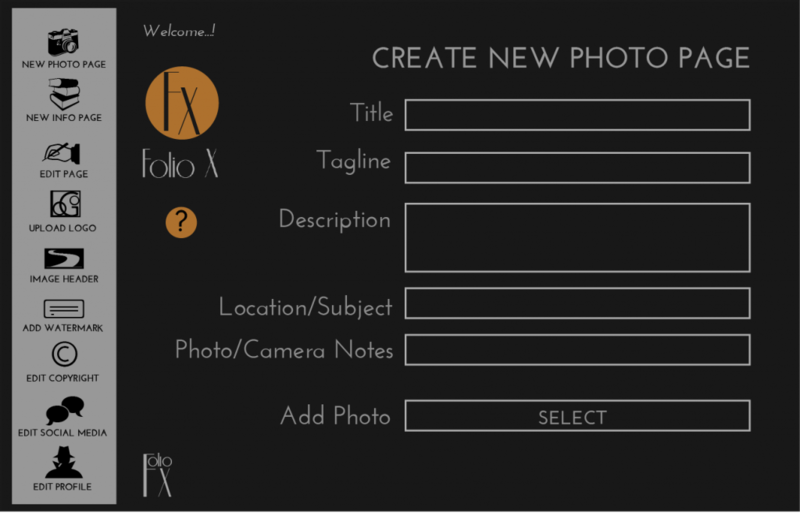 Create New Photo or Info Page with options to add titles, descriptions or photo notes and to upload images. Edit Existing Pages. Upload an Image Header. Upload a Logo. Add a Watermark. Edit Copyright Information. Edit Social Media Bar. Edit Profile. Help sections are available for every option and identified by icons which open up to provide information and helpful links. The Upload Image screen has help sections on image file types, file sizes, image dimensions, resolution and how to optimize an image using software like Photoshop or Lightbox or an online service. New pages are automatically added to the menu and ‘previous-next’ navigation links at the bottom of the page. Thumbnails of each image are automatically generated for optional addition to menu and page navigation. Admin section for adding a new photo page. 12 Places of Unexpected Beauty in New York City. This site uses the optional image header.